We wanted to make you aware of the outcome of a meeting that was held on March 27th by the local community organizations, the 19th district police, OEMC, Aldermen Tunney’s and Capplemen’s representatives and the Chicago Cubs regarding neighborhood protection, pedestrian and vehicular traffic flow and safety for the 2015 season which begins this Sunday night. 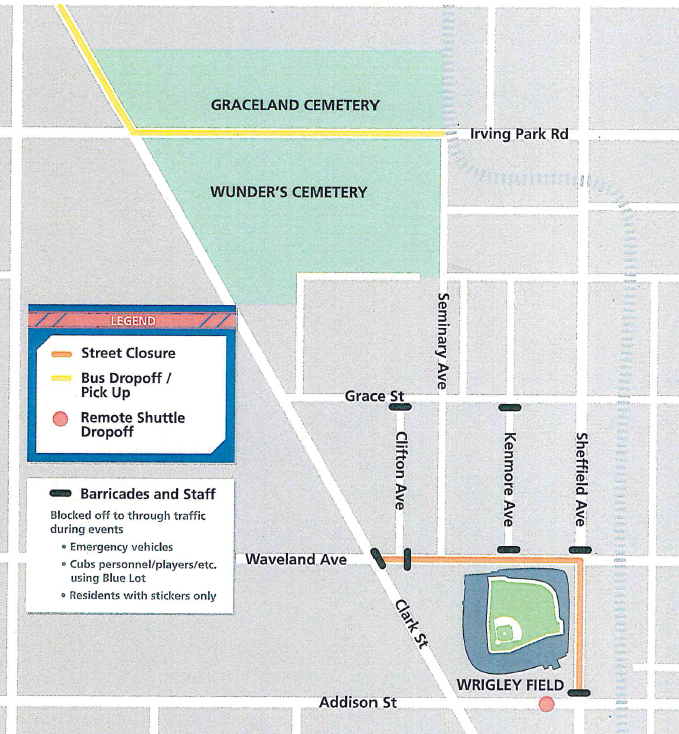 The police are requiring a lane of street be cleared and available for emergency vehicles on both the 3600 block of Sheffield and the 1000 block of Waveland on days when events are held at Wrigley Field and the rooftops to ensure public safety. The street will not be open to regular vehicles. The police are going to send messages to the limo and taxi companies, along with UBER and similar companies, warning them not to be parked / standing on our residential streets or they will be ticketed. They are also going to instruct them that the designated drop-off/pick up area is on Addison near the corner of Sheffield. OEMC is going to instruct the traffic aides to allow residents into the area with proof of residence, i.e., driver license, so you should not be endlessly rerouted to reach your home. There are no plans by the Cubs to open any type of walkway on the Eastbound side of the 3600 block of Clark St. this season. All Charter Busses are scheduled to load and unload and park on Irving Park Rd between Seminary and Clark. Additional busses will be directed to park on the East side of the 4100 block of Clark St. Bus passengers will be met by Cubs employees in green jackets to show them the way to the ballpark using Clark Street. They are being discouraged from going through Kelly Park, although I imagine some will, along with the people parking in the Irving Park Lot. Busses with special needs passengers will unload on the North side of Addison in front of the Captain Morgan Club, along with shuttle busses to/from the remote parking lot on Rockwell and Irving Park Rd. We have requested the Cubs provide a crossing guard for the intersection of Seminary and Grace to facilitate pedestrian crossings. We have requested that portable toilets be placed near the entrance of the Irving Park Rd lot, near Grace St in the Blue lot, Near the entrance of the Green lot and some in the Orange lot next to the Piano Man bar on Clark. Pedestrian traffic to and from the Addison Red Line are going to be directed by Cubs personnel in green jackets to use the alley behind the 3600 block of Sheffield for access, due to narrow sidewalk ways on Sheffield and the entire street being inaccessible to pedestrians. The Blue lot will not be accessible to pedestrians or the Cubs shuttle golf carts going to the Green lot. The Blue lot is going to be fenced off and used for VIP parking and the area for the player parking will be tented, including side walls. This will remain 24/7 for the entire season. Please be cautious when walking around that area. The Cubs are planning on having the gigantic Jumbotron in left field working for opening day and beyond. The police have also told business owners and are asking residents that no deliveries are to be scheduled 2 hours prior to games in the area from Halsted – Racine and Grace – Roscoe. This does not apply to UPS, Fed Ex, etc., but should help facilitate traffic around the park. The Cubs are promising upwards of 20 employees in green jackets to help with the busses and pedestrians. This is in addition to the people in the yellow jackets after games. On Opening Night they are having the bank “Fall Out Boys” play 3 songs on the field before the game. Estimated start time is 6:30, the gates will open at 4:30. Below is the map provided by the Cubs. The yellow area shows the bus parking / loading area. The Orange is the street closure. They are also planning on closing the 3700 blocks of Clifton and Kenmore to all but local traffic with barriers. The Gold parking lot on corner of Clifton and Waveland will be used to media trucks and the cable will run over the conduit from the corner of the Blue lot to the ballpark. We have been assured that this is just temporary and they will be buried at some point in the construction. Download a PDF of the map above here. The Cubs have sold 32,000 tickets for opening night. If you see a problem, report it to the HOTLINE at 866-427-3869. It now goes directly to the 19th District and to the Wrigley Task Force. You should also call 911 for emergencies and 311 to report other problems. If you don’t call, our neighborhood doesn’t get allocated the resources needed to remedy the problems, so call even if the offender is going to be long gone before someone arrives. This pertains to rats, people urinating in public, taxies & others zooming down alleys, limos parked on residential streets, etc. While it may seem silly to call, it needs to be tracked by the city that there are issues. If you have questions that were not answered in this e-mail contact Mike Lufrano or Matt Kenny of the Cubs, your alderman or the appropriate city agency. This entry was posted in Community News and tagged Cubs, Parking, Wrigley Field on April 2, 2015 by elvn_updates.